It was the ultimate test for a team on the rise, the youngest club in baseball taking on the Goliath of the sport. The Phillies came to Boston having dropped three straight to a Cincinnati team they should've easily handled, meaning an already important two-game set against baseball's best carried even more importance. For 13 innings the Phillies and Red Sox fought in a contest that had more of an October feel than late July at Fenway Park, but Blake Swihart smacked a Luis Garcia fastball that hung up in the zone for a double to right to drive in Eduardo Nunez and ultimately give Boston a walk-off 2-1 victory. It was an entertaining match-up from start to finish, but the outcome coupled with a Braves victory sliced the Phillies' margin atop the NL East at a half game. "It stings. It's a punch in the face," Phillies manager Gabe Kapler said. "But we've gotten punched in the face many times this year and come back the next day prepared to fight again. That's what defines us." Aaron Nola was masterful, relying heavily on his secondary pitches to bewilder a Red Sox lineup littered with potential threats. Over eight innings he scattered just four hits and struck out five. He surrendered a leadoff double to Brock Holt in the eighth and escaped unscathed. It was that type of performance. He threw 105 pitches, 73 for strikes. "It was probably the pitching performance of the ear," Kapler said. "From the beginning to the end when he came out of the game, he was sharp with all his pitches. In fact, there were instances in his last inning of work where I thought his ball had some of the best life it had all game. He used his breaking ball at will and essentially controlled everything he could control." Ahead 1-0 in the third inning, the Phillies appeared primed to increase their lead as Rhys Hoskins doubled off the scoreboard in left field and Odubel Herrera followed with a single. Carlos Santana then laced a grounder to third that resulted in a 5-2-6-5 double-play as Hoskins unwisely broke for home. Realizing he was going to be tagged out, he gestured Herrera to head to third but he didn't slide and he and Hoskins ultimately were tagged out. Helmets were slammed and hands went on hips. It was the type of mistake a team in a pennant race can't afford to make. Youthful exuberance isn't an excuse. "I feel that I should have slid to third to make a harder play for the third baseman," Herrera said through the club's translator. "I should have done better." Herrera made another blunder in the fifth, breaking in on a Nunez liner that buzzed over his head in center field before eventually rolling all the way to the wall. The miscue allowed the Red Sox to even the contest as Jackie Bradley Jr., who reached via a single earlier in the frame, crossed the plate. "It was a straight line drive that I didn't read well," Herrera said. "Again, I should have done better." Kapler said afterward that he had a "chat" with Herrera about his night and was impressed with what he did at the plate, finishing 2-for-4 with a pair of walks and a double. "I want Odubel to do well," Kapler said. "That's what I think about all the time. How can we put him in a position to succeed and be the best version of himself. When he is the best version of himself he's unstoppable." The Phillies scored a run on Red Sox starter David Price in the second inning as Asdrubel Cabrera opened the frame with a lead-off double and Maikel Franco followed with an RBI-single. Price finished the night surrendering eight hits over eight innings while collecting five strikeouts. 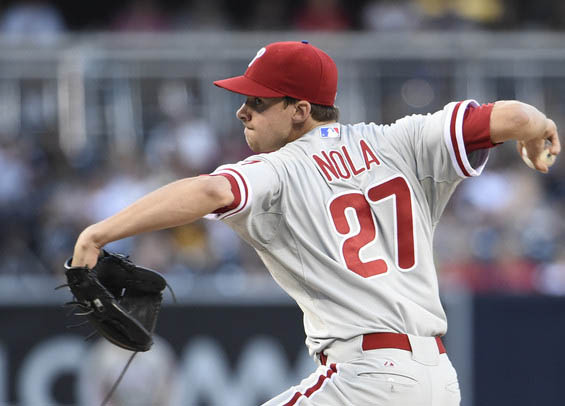 Even in defeat, Nola shined on what undoubtedly was the biggest stage he's performed on at the major league level. "He deserved a better outcome," Kapler said. "Unfortunately, that's just not how baseball works." The two clubs conclude their two-game set on Tuesday with Jake Arrieta facing Drew Pomeranz. For the Phillies, it'll also be a chance to snap a four-game losing streak.